One of the many thing that I love about the fashion blogging world is the opportunity to discover new and hidden talent. One such gem I was fortunate enough to find is Jagriti Giria. Jagriti is a young Bangalore based entrepreneur who has managed to turn her passion into a blossoming business. In 2011 she decided to combine her dream of starting her own business with her passion for fashion, art and aesthetics to create her brand, Love Art Fashion. 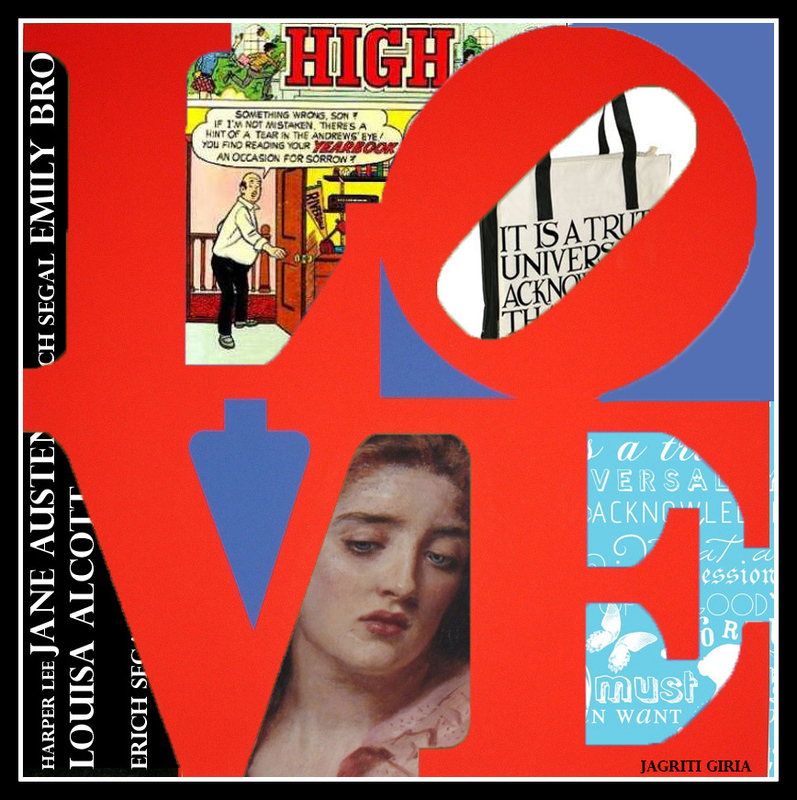 Love Art Fashion is a new and up coming fashion and lifestyle brand. From bags to clothes to home decor, the goal of this brand is to provide its customers with unique signature pieces at a reasonable price. Jagriti has literally transform her beloved books into bags. Being a book lover myself, I could not help but be drawn to this collection of bags inspired by book cover art. Jagriti believes it is important to have a one dominating theme and concept that inspire the entire collection. This moodboard created by her clearly outlines the direction in which her collection will take. The shape, colour combination and art work are all well planned out in advance before the final product is created. Personalised bags are custom made as per the needs of a client. The beauty of personalised bags is that they are not only made as per your preference in shape, colour and fabric choice, but you can also choose a theme of your liking. 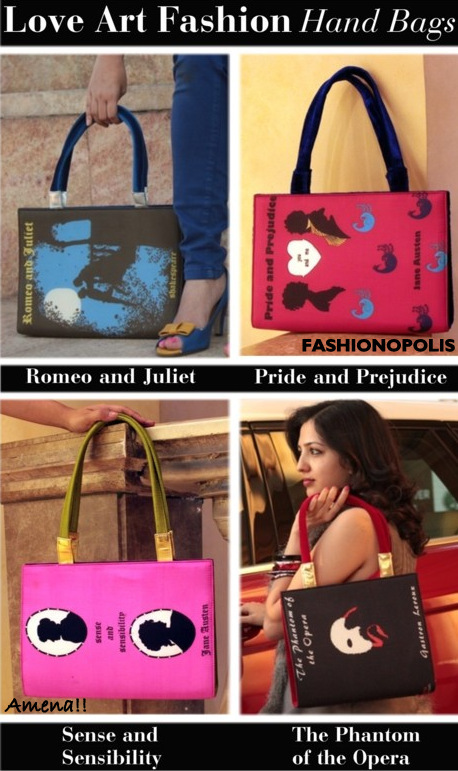 From personal photos to favourite cartoon logo, these bags can be made as per your needs. The starting price for personalised bag is Rs. 2100/-Not only are Love Art Fashion bags a visual treat and stunning statement pieces but each one is crafted and designed to last. Love Art Fashion currently retailed all over India through itshandmade.in Other than that Jagriti frequently has pop-up stores in Banglore. Being a creative person, Jagriti does not restrict herself only to bags. She also designs clothes and home décor. The long term goal for this young enterprising Bangalore girl is to open her own store. She is also open to the idea of collaborating with artists, stylists and designers to create unique collections! 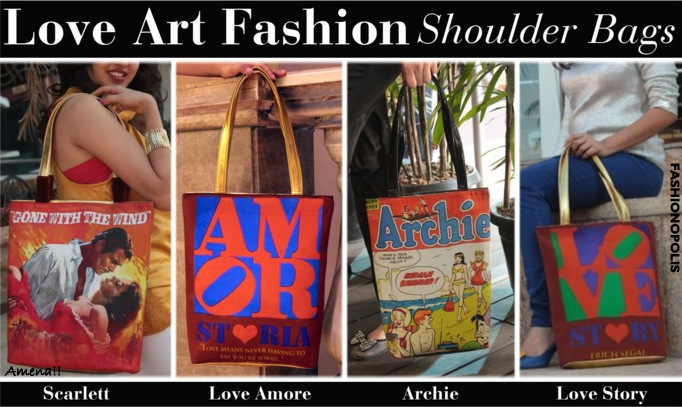 The first time I saw a Love Art Fashion bag, I instantly fell in love with it. The book and bag lover in me wanted to grab these stunning combined works of fashion literary art. Whether you are a book lover, bag lover or a life long hoarder of both, Love Art Fashion has something for every stylish woman. What do you think of Love Art Fashion and their book themed new collection? And if you could get one bag which one would it be? Share your view with me in the comment section? In celebration of International Women's Day, Love Art Fashion & Fashionopolis present an exclusive FACEBOOK GIVEAWAY. Click here & participate. P.S: All photos in this post have been creatively conceptualized and clicked by Mr Nicest Guy himself; Praveen, one of the brainchild's behind Wooplr. A must visit site for all you fashion, food and style lovers. The peplum trend is by no means a new trend. Ever since Christian Dior debuted the classic Dior peplum in 1947 this trend has been in and out of fashion. While the peplum trend dominated the late 40's, 50's and 80's, it has made a huge comeback in 2012 and from the looks of it going strong in 2013 as well. Since this trend is having a major fashion moment, I decided to feature it in this week's 'From A.M to P.M' segment. The beauty of this chic white peplum top is that it can be dressed down for a day look/office wear as well as jazzed up for a night/party look. The A.M. look is inspired by the classic combination of a peplum top and a pencil skirt. This look is perfect for women with an hourglass, apple or pear shape body structure. Eg. Beyonce, Scarlett Johansson, Sofia Vergara. The basic design of the peplum is such that it clinches at the waist while the flare makes the hips and thigh appear smaller. Pairing a peplum top with a pencil skirt enhances the curves in the right places as well as make you look leaner. The P.M. look is inspired by the peplum look of the 80's, where women used to pair their peplum tops with A-Line or pleated skirt. Pairing a peplum top with a A-Line or pleated skirt is well suited for women with a petite body structure. Eg. Jessica Alba, Mila Kunis, Blair Eadie. The peplum will help accentuate the midsection and the full/pleated skirt will create a illusion of curves. Keep in mind: While the peplum look is flattering to most body types, people with a bulky midsection must avoid a peplum outfit. Also, when choosing a peplum top/dress, make sure the length, the style and shape is flattering to your body type. The idea of wearing the peplum is to highlight the waist and cover the tummy and love handles. If that purpose is not being served, then you got the peplum trend all wrong. Are you ready to try out the peplum trend? And how would you like to style the peplum piece? Share your view with me in the comment section. Whether you are single, committed or in no hurry to find love, Valentine's Day; the day of love as it is often called, has officially arrived and no matter how hard you try you just cannot ignore it. From Facebook promotions to Twitter contest to horrid radio jingles we are constantly reminded that this day is upon us. While this may be the day of love, the one thing I hate about it is how people think they need to over dress themselves in all froms and symbols of love. From cheesy heart motifs to head-to-toe pink, this days gets the tacky out of most people. 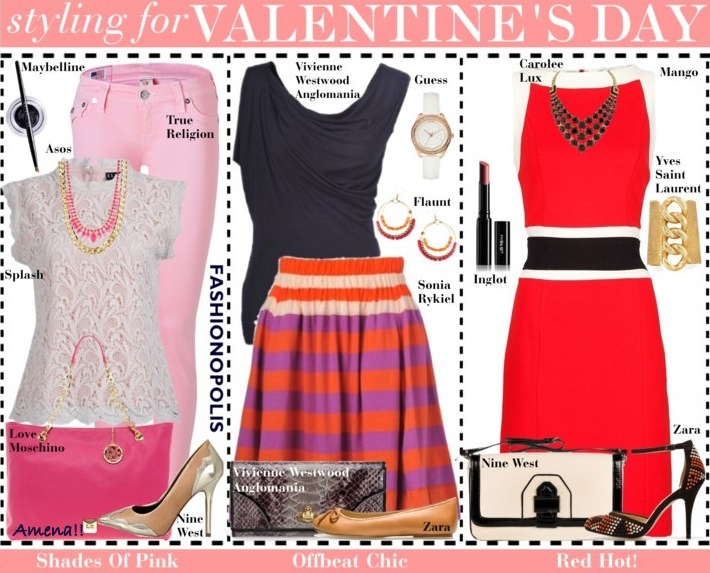 The best way to style a V-Day look is by choosing one trademark symbol of love-colour, motif, print-and work the remaning look with it. You don't need to wear every possible symbol of love to express how you feel. 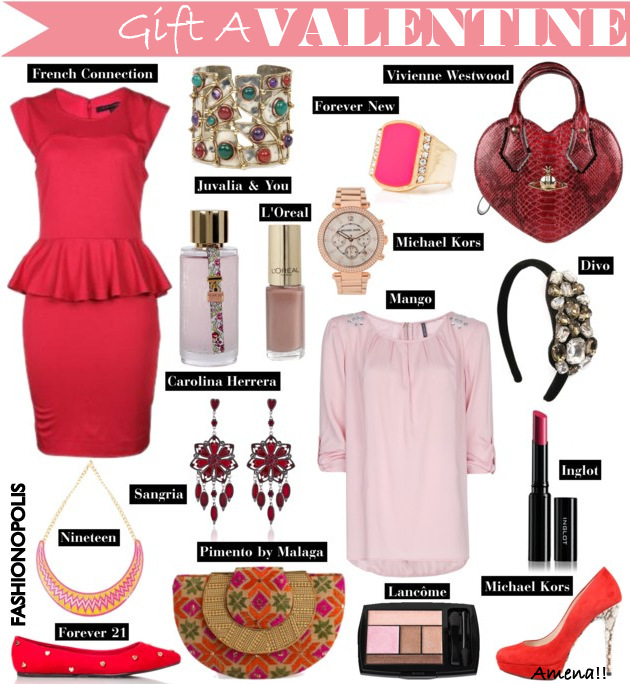 Here are some of my Valentine's Day styling option. 'Shades Of Pink' look is a modern take of a classic romantic look. With a combination of delicate lace and pink it is pefect for a brunch date as well as day at the office. 'Offbeat Chic' is for those who choose to stay away from pinks and reds on this day. Create a look that has tints and tones of colours synonymous with Valentine's Day and you got yourself an ensemble that is perfect for a movie date or weekend shopping. Classic red is the colour of love, passion and Valentine. For those who are feeling tad bit too festive on this day or just want to flaunt their love, the 'Red Hot!' look is perfect for anything from a romantic dinner to a fun Girls Night Out. For those who are looking for last minute V Day gift ideas, here is your complete V Day gift guide. With whomever and whichever way you like to celebrate this day, here's wishing you all a very Happy Valentine's Day. While through out the year it is my girlfriends who drag me along on their shopping trips, come Valentine's Day it is their better half's that start calling in levels of panic, "Amena, are you free today, we need to go shopping" or "Amena, what is the new fashionable thing women want+where can I buy it?" It is always fun watching men trying to make sense of things they otherwise best ignore. If you are one of those who is struggling to find the right V Day gift for your ladylove, then here are a few of my suggestions that can help you transform the day devoted to love into a memorable one. P.S. All the approximate INR prices are based on the current dollar and pound conversion rates. 1. All things sweet and chocolate-y: You can never really go wrong with it. From a simple box of store brought chocolates, to custom made macaroons and cupcakes there is something for every lady. 2. Flowers: Only if she is allergic to it, flowers are loved and welcomed by all women. FYI, don’t just stick with just red roses. We do have a lot more variety available, be creative with your bouquet selection. 4. Personalized gift: Anything from a handmade jewellery box, to dinner cooked by you or a sign up for couples dance class, to writing a poem just for her, there are many out-of-the-box ways as well to express your love for her. F.Y.I: The trick to doing Valentine's Day gift correctly is finding a gift that can be used/worn the remaining 364 days as well. The gift on all accounts should NOT look tacky or costumey post February 14th. Love may be in the air 24x7, but there is only one day a year just devoted to celebrating it in all its grandeur. Whether you are buying it or making one yourself, do share your Valentine's Day gift ideas and suggestions in the comment section.